Discussion in 'Nevada Flyway Forum' started by JDK, Apr 18, 2017. It’s official: Nevada bowhunter Frank Cheeney now holds the world record for largest typical mule deer ever taken with a bow. 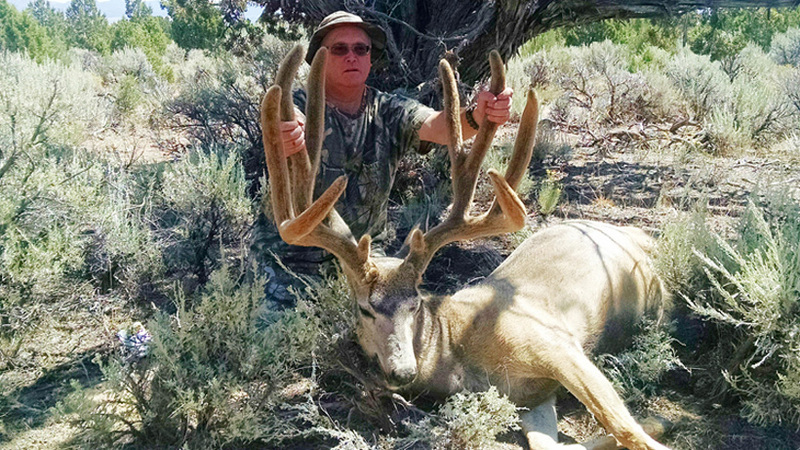 Cheeney shot the monster buck on Aug. 13, 2016 while hunting with his son, Aaron, in southeastern Nevada. Luck was on his side as they stalked through the dusty sagebrush, trying to edge closer to a group of bucks bedded down. While Cheeney waited for a shot, the largest in the bunch stood, making this hunt one for the record books. That buck was measured during the Pope And Young Club’s (P&Y) 30th Biennial Convention by two separate panels consisting of qualified measurers as well as a Boone & Crockett representative. Cheeney’s buck scored 205 6/8", topping the previous typical mule deer world record at 205 0/8". An avid outdoorsman, Cheeney said that he learned how to hunt and fish by doing both with his dad, adding that, to him, hunting was always about more than just a trophy. Congratulations, Frank Cheeney, on your amazing new record! That's an incredible buck. Frank Cheeney has topped them all! Congratulations to you Frank for a great stalk and a well placed arrow. Does P&Y allow velvet when scoring? If so it's a little BS to disadvantage the hard horn deer. He stripped the velvet and measured it hard horned. There's no question it is the new record.